Complete your N-Strike nerf collection and prepare for the ultimate in battery-powered ejection with the Nerf N Strike Vulcan EBF-25. Be ready for any challenge with the NStrike Vulcan EBF25 blaster - a fully automatic nerf dart system. Load the blaster with fresh batteries and release at a rate of up to three nerfs per second. The belt feeds automatically through the blaster, letting the nerf darts propel via the piston-powered internal launching system. Switch to single-shot mode for precision aim. The removable tripod folds for easy transport - or a quick escape. 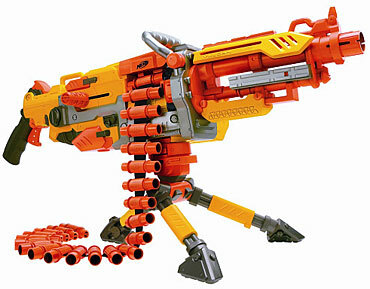 Even your toughest opponent won't know what happened when you unleash the power of the N-Strike Vulcan EBF-25 blaster.